19:32The sixth lot came out to the children of Naphtali, even for the children of Naphtali according to their families. 19:33And their coast was from Heleph, from Allon to Zaanannim, and Adami, Nekeb, and Jabneel, unto Lakum; and the outgoings thereof were at Jordan: 19:34And then the coast turneth westward to Aznothtabor, and goeth out from thence to Hukkok, and reacheth to Zebulun on the south side, and reacheth to Asher on the west side, and to Judah upon Jordan toward the sunrising. 19:35And the fenced cities are Ziddim, Zer, and Hammath, Rakkath, and Chinnereth, 19:36And Adamah, and Ramah, and Hazor, 19:37And Kedesh, and Edrei, and Enhazor, 19:38And Iron, and Migdalel, Horem, and Bethanath, and Bethshemesh; nineteen cities with their villages. 19:39This is the inheritance of the tribe of the children of Naphtali according to their families, the cities and their villages. 19:40And the seventh lot came out for the tribe of the children of Dan according to their families. 19:41And the coast of their inheritance was Zorah, and Eshtaol, and Irshemesh, 19:42And Shaalabbin, and Ajalon, and Jethlah, 19:43And Elon, and Thimnathah, and Ekron, 19:44And Eltekeh, and Gibbethon, and Baalath, 19:45And Jehud, and Beneberak, and Gathrimmon, 19:46And Mejarkon, and Rakkon, with the border before Japho. 19:47And the coast of the children of Dan went out too little for them: therefore the children of Dan went up to fight against Leshem, and took it, and smote it with the edge of the sword, and possessed it, and dwelt therein, and called Leshem, Dan, after the name of Dan their father. 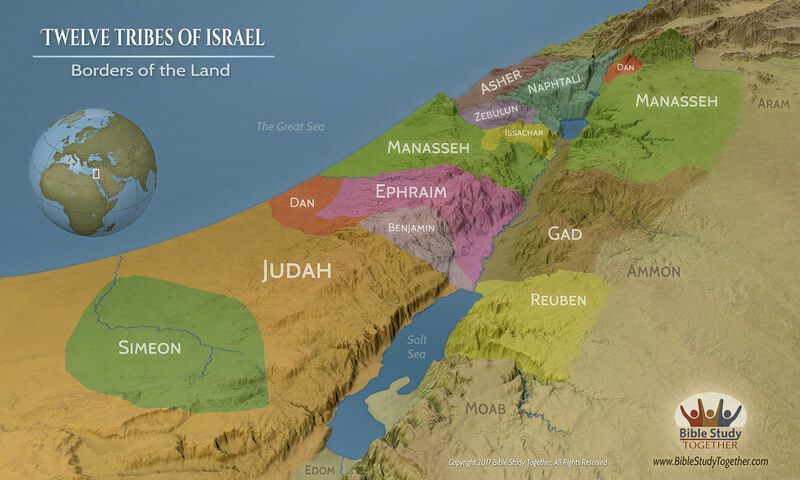 19:48This is the inheritance of the tribe of the children of Dan according to their families, these cities with their villages. 19:49When they had made an end of dividing the land for inheritance by their coasts, the children of Israel gave an inheritance to Joshua the son of Nun among them: 19:50According to the word of the LORD they gave him the city which he asked, even Timnathserah in mount Ephraim: and he built the city, and dwelt therein. 19:51These are the inheritances, which Eleazar the priest, and Joshua the son of Nun, and the heads of the fathers of the tribes of the children of Israel, divided for an inheritance by lot in Shiloh before the LORD, at the door of the tabernacle of the congregation. So they made an end of dividing the country. 20:1The LORD also spake unto Joshua, saying,20:2Speak to the children of Israel, saying, Appoint out for you cities of refuge, whereof I spake unto you by the hand of Moses:20:3That the slayer that killeth any person unawares and unwittingly may flee thither: and they shall be your refuge from the avenger of blood.20:4And when he that doth flee unto one of those cities shall stand at the entering of the gate of the city, and shall declare his cause in the ears of the elders of that city, they shall take him into the city unto them, and give him a place, that he may dwell among them.20:5And if the avenger of blood pursue after him, then they shall not deliver the slayer up into his hand; because he smote his neighbour unwittingly, and hated him not beforetime.20:6And he shall dwell in that city, until he stand before the congregation for judgment, and until the death of the high priest that shall be in those days: then shall the slayer return, and come unto his own city, and unto his own house, unto the city from whence he fled.20:7And they appointed Kedesh in Galilee in mount Naphtali, and Shechem in mount Ephraim, and Kirjatharba, which is Hebron, in the mountain of Judah.20:8And on the other side Jordan by Jericho eastward, they assigned Bezer in the wilderness upon the plain out of the tribe of Reuben, and Ramoth in Gilead out of the tribe of Gad, and Golan in Bashan out of the tribe of Manasseh.20:9These were the cities appointed for all the children of Israel, and for the stranger that sojourneth among them, that whosoever killeth any person at unawares might flee thither, and not die by the hand of the avenger of blood, until he stood before the congregation. 1At the same time came the disciples unto Jesus, saying, Who is the greatest in the kingdom of heaven?2And Jesus called a little child unto him, and set him in the midst of them,3And said, Verily I say unto you, Except ye be converted, and become as little children, ye shall not enter into the kingdom of heaven.4Whosoever therefore shall humble himself as this little child, the same is greatest in the kingdom of heaven.5And whoso shall receive one such little child in my name receiveth me.6But whoso shall offend one of these little ones which believe in me, it were better for him that a millstone were hanged about his neck, and that he were drowned in the depth of the sea. 46Then there arose a reasoning among them, which of them should be greatest.47And Jesus, perceiving the thought of their heart, took a child, and set him by him,48And said unto them, Whosoever shall receive this child in my name receiveth me: and whosoever shall receive me receiveth him that sent me: for he that is least among you all, the same shall be great. What is the purpose of the cities of refuge? How does your understanding of greatness contrast with Jesus’ description of greatness? How do people cause others to sin and how can you avoid it? What practical steps can you take to become least in the kingdom of Heaven? Learn a spiritual lesson from watching a child.